I’ve got a great new flower pattern and tutorial for you! I’ve been brainstorming how to make a “giant flower” for a while, and I’m finally happy with what I’ve come up with. I’m loving this flower and am so exited about all of its potential uses. What makes this flower “never-ending” is how it is built. Between each round of petals is a round of increases, so the petals don’t pile on top of each other. What that means is that rather than getting taller and bulkier, the flower stays the same height, and just gets wider. So, theoretically, you could keep adding rounds of petals and increases to make it the size of a football field, and it would still only be less than an inch tall, making it great as an addition to things like blankets and throw pillows. It’s not 1-dimensional like your typical appliqué; it has depth and interest, without the bulk. And what’s really cool is that this flower works right into a granny square, so you can use it in an afghan or as a throw pillow cover. I’m telling you, the applications are as endless as your imagination. If you want to see how I turned this flower into a granny square, check out this blog post! I have gotten so many emails, messages and comments about the pattern for the pillow shown in this photo. It is not my creation (someone used the Neverending Wildflower and turned it into a pillow), and unfortunately, the photo of it keeps getting linked to me. I do not have this pattern variation. I can, however, tell you that the stunning blanket pictured with it is Sophie’s Universe by Dedri Uys. Scroll down for the Never Ending Wildflower pattern! You can purchase an inexpensive, convenient, ad-free PDF of this pattern on Etsy! Yarn: The yarn you choose doesn't matter, as long as your hook is a good match for it. 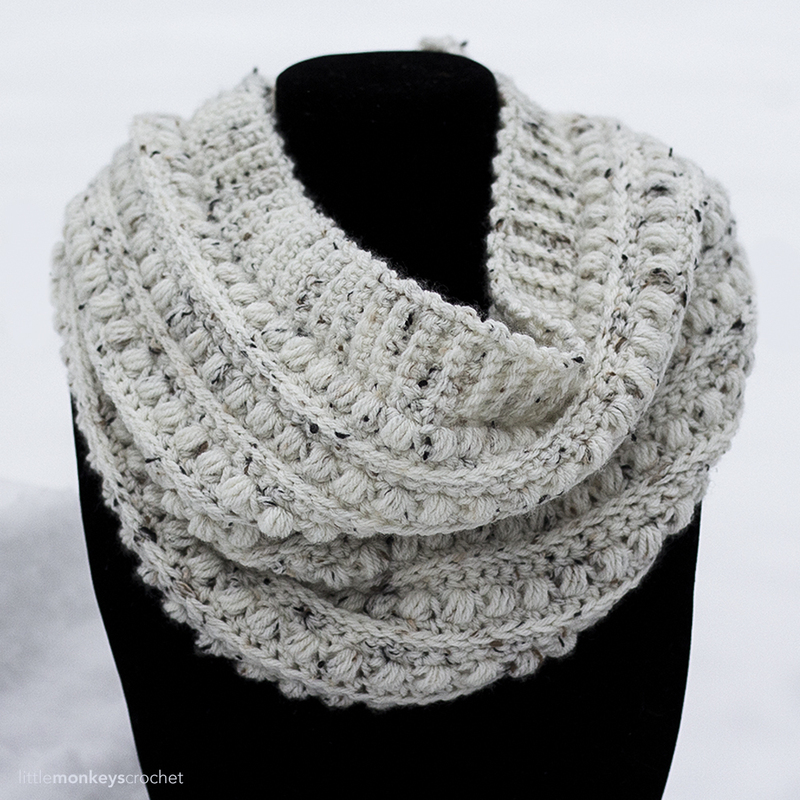 I used an H hook and worsted weight yarn for my sample in the photos, which measures 8" across. Each round of petals has 12 total petals. The first round of petals will cover 1 ST (of the previous round) per petal. The 2nd round of petals will cover 2 STS per petal, the 3rd round 3 STS, and so on. I'm giving you instructions up to 5 rounds of petals, but using this formula and a little imagination, you can make it even bigger. Thank you so much for this pattern! It’s beautiful! Will be using this on my beach bag I’m going to crochet for my cruise next year! Again, thank You! Lovely! Can’t wait to make this. I can see it as a giant round flower pillow! What a nice pattern~ Thanks for sharing. lOVE THIS, SO MANY USES!! tHANK YOU!! I love this pattern. I can’t wait to make it and add it to a hat for my granddaughter. Have you considered doing a video on this flower. thanks so much it is gorgous! There is a tutorial for this flower pattern on Moogly. That must be a different pattern. Please disregard. This was an error. Beautiful! Thank you for sharing this with us. Can’t wait to try it! I LOVE this pattern and instantly saw it as a textured, decorative rug for a small room that doesn’t get much traffic. Would it work? Beautiful pattern, thanks so much! Your talent is wonderful, and your sharing is wonderful. Thank you. This so awesome! I definitely will be making lots for hats, gifts, pins, etc! Thank you for this post. Such a beautiful flower pattern. Sería posible que los pusieran en español ? I love this flower pattern. Will make it into a purse. Thank you for sharing your pattern it is beautiful and look forward to using it. has anyone made a bag out of it? I want to keep going past the 5th round of petals. As the number of spaces grow for the petals should I just continue to add TRs & flank them by the ch2s & DCs? Thankyou for sharing your expertise with us, I’ve been looking for a slouch pattern for ages, I’m on with it now ,my friend will be delighted. What a gorgeous flower! I see cushions for my sofa with this….. I was just looking at some coasters I made and told my husband that think I created something and had thoughts to add something. Lol to funny.. I love visiting your website and adore your patterns. I too enjoy the clean and look in patterns. Yours are divine! Thank you for sharing them with us. I love this flower but as a beginner, I’m having difficulty figuring out which stitch to start DC in for the petals. Do i dc into both loops of the outer rim of the magic circle? Or just one loop? Can you help? ! FLO means Front Loop Only, and BLO means Back Loop Only. So for the petal rounds, you’re working in the front loop only. I hope that helps! This is so beautiful. Thank you for sharing this post. You are truly talented. Thank You, I am always looking for extra special embellishments for head bands, greeting cards, bead making and other WOW jewellery. I teach paper bead making at a local craft shop and love to wear the other goodies I am inspired to make. Beautiful Flower !!!!! I am New to the world of crochet…and now in my “Twilight years” I have finally came to Grips with it. this pattern is most delicate and beautiful. Plan on making a blanket. Thank you for sharing! I love the name of your blog and all of the patterns that you so willingly share with everyone. Thank you so very much. I have your blog in my favorites so I will be back to check out what you are up to. 🙂 God bless. No encuentro enlace en el blog para poder ponerlo en español( castellano). ¡Hola! Yo no tengo actualmente una traducción en español para cualquiera de mis patrones. Si usted puede traducir esto, estoy feliz de publicarlo en mi sitio web y darle el crédito. ¡Gracias! This is by far the prettiest flower I’ve seen. The versatility makes it a keeper. I’m working on hats for little girls and needed a flower. This in a smaller version will work perfectly. Thanks for sharing! I tried to sign up for your newsletter but I kept being told my email address was invalid. Thank u. Absolutely beautiful. Ideas are flowing for uses. Colors will be joining design. Continue…. Thank you for this lovely pattern, I’m already thinking how to use it. Can I ask you if it would make a floor rug? Hey Rebecca, this is just wonderful. 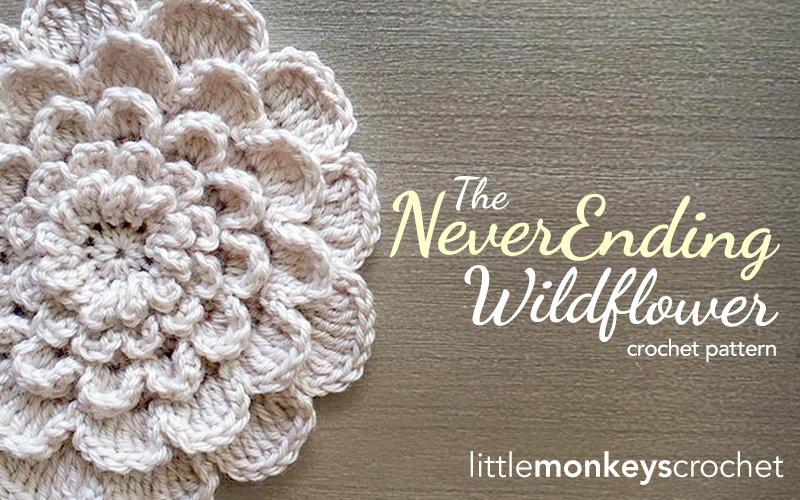 Finally a crocheted flower that’s beautiful, easy to make, and functional!! Thanks for sharing! I am new to your site but have signed up for your free email newsletters. Terrific website! I have been looking for a flower pattern such as this to use as an applique to put on on fancy crochet legwarmers that I plan on making. Want to design my own pattern. This will be just the perfect flower design. Thanks for this lovely pattern. I will use it happily. I love your patterns. Make me know any news about them. congratulations for the beautiful job. please have your patterns so we can print them off. right now there are 66 comments and I sure do not want those so to heck with it. just skip this pattern. Feel free to skip this pattern. It is a completely free service, after all. For those who wish to print, I have provided multiple options. 1) Use the “Print” button located just above where the pattern begins. From there, if you follow the directions, you can delete everything you don’t want (including comments). 2) Purchase an ad-free, convenient PDF using the link just below the pattern title (where the pattern begins). Apart from not allowing comments on my blog posts at all, I’m not sure what more I could’ve done. When you hit the print button, instead of hitting “print all”, click on the button that allows you to select which pages to print. Then you can select the range of pages you want to print, omitting the pages with comments. I love this pattern ! 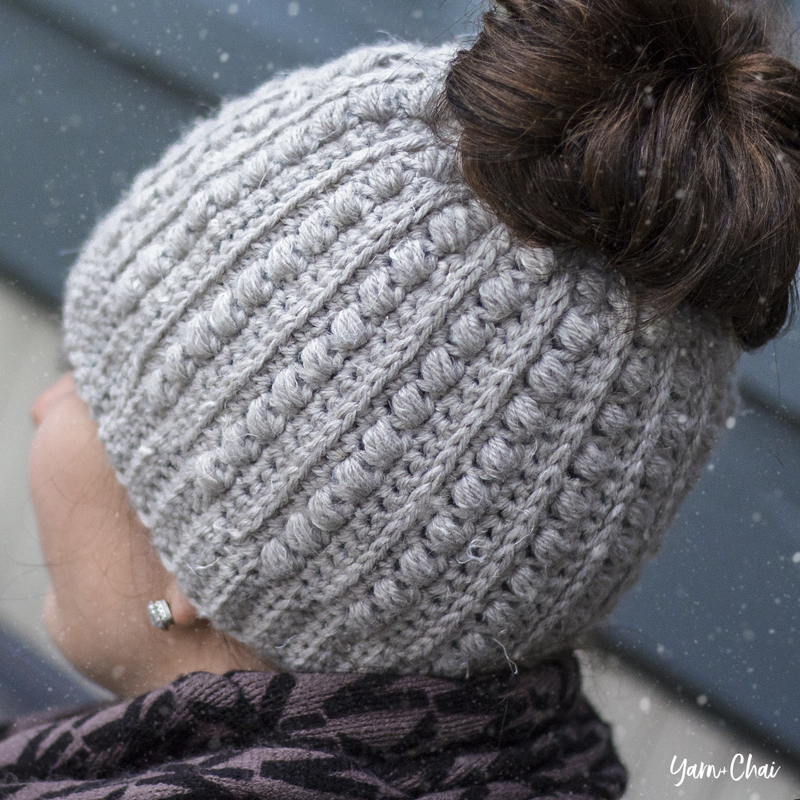 I do the 1st 5 rounds then stop increasing & continue on to make the cutest hats. Thank you for this awesome pattern!!!!! Beautiful flower. Thank you for sharing the pattern. i am so confused on the location of the rounds and pedal rounds. I can’t even ask a question. The second round goes in the unused loop of the first round. where does the pedal round go? This video might help. It’s a different pattern but it is the same as this, up to the 2nd round of petals. Peggy, I’m unable to do that. Sorry 🙂 You are welcome to print the pattern using the “print” button located just above where the pattern starts. Lovely! Thank you for sharing your patterns! Having problems wih redundant fabric (as the flower expands the flower buckles and is increasingly hard to force flat). 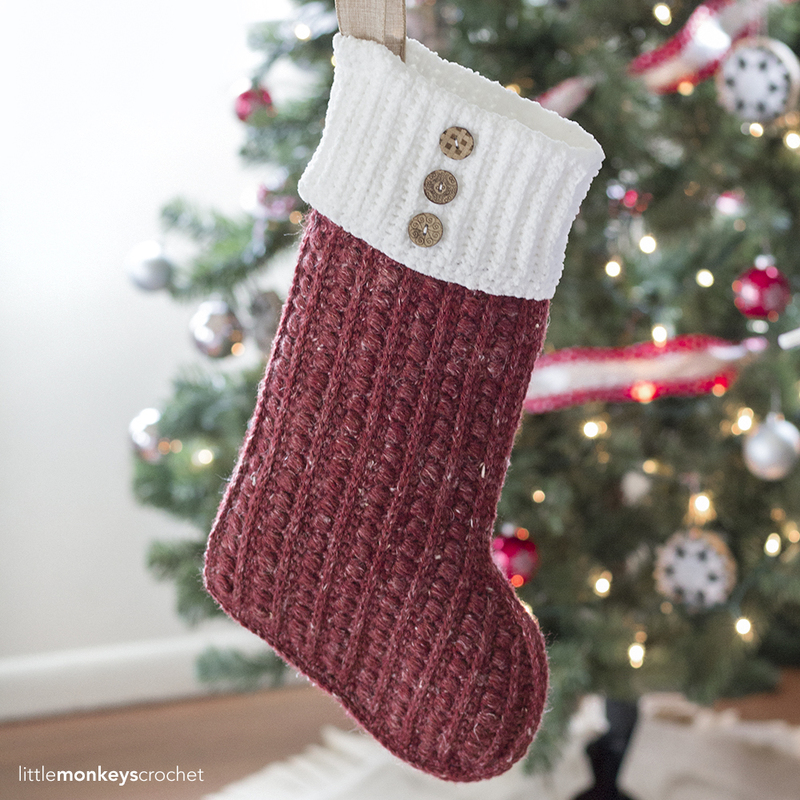 New to crochet and hoped you might have suggestions – ? Try relaxing your tension on the increase rounds. Some people’s 1st round of petals do tend to do that, though. A nice-sized button in the center usually cures it, or you can take some fabric glue and force that first round down. Thank you so very much for being generous and sharing the pattern for this never ending flower. I have had an idea like this for my bathroom rug but I wanted it washable. I will be making a few of these for different areas and I know my a couple of friends who will be asking for one, lol. Your idea of teaching us slowly over a few sessions is wonderful and unique to me. GREAT idea. Very pretty. I have been looking for a flower like this. Thank you. I’m still having a bit of an issue with this – all my issue, not yours. Have you ever thought of doing a video to show us how this is done? Personally, I would find it very helpful. Just something to consider. A video will come eventually. Until then, however, I do have one that might at least help you get started. The first two rounds of petals in this tutorial video are exactly the same pattern. Please note that after the 2nd round of petals, the video will no longer match up. Thank you for the pattern. I am thinking of making it bigger for a bed spread. looks delightful, will it work with varigated yarn or should the xolor be the same throughout? I made this into a pillow. I just made my own “pillow back” to make a pillow. that was so you share your pattern.at is so sweet of you . Love this Never ending wildflower, am showing the “other Granny’s” at our get together on a Wed how to do it. We are planning a blanket for our fete, so will be using your granny square. It will be interesting to see the combinations of colour. It’s on the to-do list! 🙂 In the meantime, I do have a video that might help get you started. It’s for the Wildflower Shoulder Bag, but the squares for the bag begin the same way this pattern does. It will get you through the first 2 rounds of petals. I sure did! Thank you for spotting that! Thanks for the pretty & simple flower pattern. I am new at making flowers, but I will try this pattern. Oh, My God, that Never Ending Wild Flower is beautiful, very much but it’s complicated too. I don’t dare begin it… Sorry. Have just finished the Never ending wildflower bag I am very happy with results Made a small purse with one flower motif on can take my I pad also a small change purse. Have lined them all and they look great. Thanks for a great project. Have you tried a pointed petal version? Do you think it would work? this is an amazing pattern. I am a novice crocheter but carefully following your concise and well written pattern, I was able to duplicate it beautifully. I love the flowerbag pattern so might continue along and attempt to make it. Thank you so much for sharing this pattern. 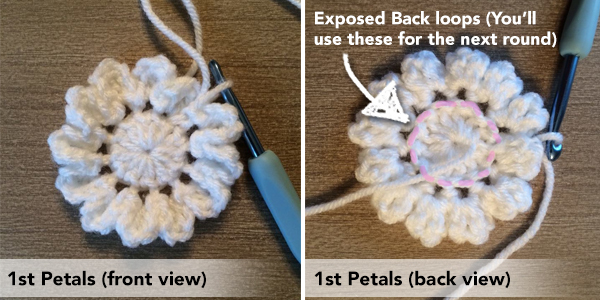 I crochet for charity and this is the only pattern I use for making my flower appliques! I just LOVE it ~ it adds class to all of my projects! This is beautiful and very versatile. Thank you for sharing. OH….MY….GAWD!!! This is my new favorite flower pattern. I love that it’s already “put together”, no sewing a spiral together. I love it!!! THANK YOU!!! Thank you for your talent and sharing this beautiful ‘never ending wildflower’ pattern. This pattern is so enjoyable and with each layer of petals, becomes more amazing! I love this pattern! I can use this for so many neat projects; from hats, scarfs, to pillows and blankets. I usually knit, but this will get my crochet taste buds going!! thank you for this great pattern! I love this pattern but I do have a question. Would it be possible to use a sport weight yarn for a lighter lacier look and make it baby Afghan size? Or maybe size it for a prayer shawl? I’ve been looking for Xmas tree patterns, are there any available? I had crochet a table cloth and my friend cut and surged it. It looks very nice after I added a boarder but I would like to get some more patterns. Thank you for the pretty pattern. I love to crochet flowers. My favorite is with thread. I’m excited to try this! I love your patterns allthough I sometimes need some translation. But as your patterns are so wonderful it doesn’t really matter. Thank you for sharing such a beautiful flower pattern! Picture instructions would be easier to follow. Thank you for your beaty flower pattern. And i have a question. can i use this pattern for my dishwash business? . and sorry i have no english well. Have a good night . Thank you so much! I admiral for your big mind. I can’t wait to start this project! Beautiful flowers with so much potential. I love this particular flower! There are so many different flowers to crochet, but this one is great because you can make it any size and it will look great. thanks, Rebecca! A really versatile pattern – I am imagining many uses for it! This is the pattern that attracted me to Little Monkeys (besides the name, of course) Those little monkeys are so-o-o-o adorable. I like making things that look a lot more difficult than they are. This just fit the bill. I’m working on the Wildflower Shoulder Bag in off while & country blue. It’s turning out to be really cute. Have had raves about it when working on it in public places. I think the strap will be braided crocheted cords in the white & blue. Thanks for the pattern. Easy to read, easy to follow instructions. What a lovely flower! I love making flowers, they are one of my favorite things to make next to purses and tote bags. I love this flower!! Your instruction are Great! I made a cushion out of this pattern– Love it!!!!! This is one of the prettiest flower patterns I’ve seen! Thank you for this pattern. I can apply this on so many items. The power of love is always found in items that are made by hand – may they be a decoration or edible! When I was younger, my family had to do this kind of thing just to keep up with the bills! It happens, now, after injuries resulting from an accident that I have to find my own way to do things for fundraisers for items needed in the home! These are just wonderful for the holidays! Thank you for this pattern, I have been looking for a nice flower pattern that lays flat and tidy. I want to tell you also that I have made a couple of hats from your hat patterns, LOVE THEM. You are so talented, thank you. I enjoy following your blog. Thank you for your creative ideas. Just made the flower and the video was so helpful. Thanks. Hello! I love this, and I was thinking of using chunky thread and making a rug? Do you think it would work? Hi Erika, I’ve made a few rugs using double knit wool and 5mm hook. This was perfect for what I wanted. I think chunky wool would make much bigger/thicker flowers. I made different sized flowers (4, 5 or 6 rows of petals) and +- 3 different colours per rug. I used a plastic non slip mesh as a backing – which makes te whole rug a bit sturdier too. This is beautiful! I can’t wait to start. Thank you! I can vision making this with some jute and then having it for a rug. Love it! Rebecca-I’m so happy to have found your site! I’m excited to explore it more. I’ve began the Wildflower Bag and am loving it! It is so obvious that the Lord has blessed you with amazing talent and I’m very thankful you are willing to share it!!! Looking forward to see what’s next! May the Lord bless you and your precious family! Haha just looked at the video and figured it out, thanks yet again for an absolutely gorgeous flower ❤? Hi, your wildflower design is beautiful. I’m looking through your site for the pattern for the pictured cushion and afghan done in matching shades of green/ teal, and beige/OR grey with what looks like a little sparkly button in the center of the flower on the cushion. They are exquisite! Can you please steer me to where those patterns are? Beautiful design!!! So easy to follow instructions 🙂 Thank you so much for sharing! I absolutely love this pattern!! So easy, so fun! Thanks so much! I absolutely love this! Do you have the afghan pattern? I want my mother to make them both! They are beautiful….thank you! where can i get the pattern for both the pillow and throw ? If you’re referring to the gray and teal version, it’s not mine. I do not have a pattern to turn the flower into a throw and I’m not sure who is responsible for the variation. The blanket in that photo is Sophie’s Universe by Dedri Uys (you can find it on Ravelry). Thank you for this pattern, I can wait to make it. One question: what yarn did you use on the sample flower that is on the couch pillow? It looks like it is variegated from dark grey to an aqua to a light grey/natural color. I LOVE that color scheme and would love to try that yarn out also. Thanks again for sharing your creative genius with us. That sample is not mine, it just keeps getting linked to me. I do not have a pattern to turn the flower into a pillow and I’m not sure who is responsible for the variation. The blanket in that photo is Sophie’s Universe by Dedri Uys (you can find it on Ravelry). What a beautiful bag. I wanted to thank you for taking the time to make this tutorial. This will be my first bag, and your tutorial is what gives me the confidence that I can do it on my own. I wonder if you would you mind sharing a picture of your bag with your leather strap attached? I think that’s the way I will go but it would help to see what it looks like. Again, realllly appreciate your hard work here in sharing via this tutorial! I came across this stunning never-ending flower of yours this morning and I instantly fell in love!! Thank you! I really love your website and will definitely follow you on it. 🙂 I am an absolute beginner crocheter, and have just gone into a tiny business with 2 friends of mine, selling mostly South African natural, hand-dyed and organic yarns, & stock a variety of knitting/crochet accessories. We are in Johannesburg, South Africa, and are all passionate about anything to do with wool/yarn. I do not wish to do anything illegal or offensive, and hope you will not be annoyed that I have posted a pic of your magnificent flower on our Facebook page, called The Yarn Tree. I am simply to trying to attract people’s attention & invite them to our studio,. Should we get a good enough response, we would love to hold a morning workshop in our studio, and crochet this flower together as a group. Please could you let me know if this would be a problem for you Rebecca? When I posted the flower pic on Facebook, I have mentioned your website. I hope what i have done is the “correct ” protocol and we haven’t offended you in any way, as that is not our intention. Thanks very much and we look forward to seeing more of your fab patterns and ideas. I love the never ending patterns. I’ve tried them all and different variation of colors. I would like to make a big flower, 9 or 10 petals, but I keep messing up the count for the first row of the square. I know there must be a formula for the number of hdc and sc but I can’t figure it out. Can you help me? Just finished crocheting the flower and loving it’s style. Thank you for sharing the pattern. It is easy to follow your instructions and I appreciate the time you spent developing the design. It’s a keeper! What a marvellous blanket, which will be my next project! Thank you for sharing your patterns. Do you have a pattern for the blanket as well? Sorry just wanted to know if there is a pattern for the blAnket as welll. OMG This is so beautiful. I’m so happy with how it turned out. I’m using it in a large collection of dreamcatchers over my bed. I added another row of double crochet on the back loops to give me something to attach to the hoop with. The hoop is smaller than the flower (falls at the base of the last row of petals ) so the hoop itself is not visible. The flower stands up a bit and looks like it is floating on the wall. I hope that is okay with you. It’s just for my personal use. Thank you for sharing this. Thank you….it is a beautiful flower!! Thank you for sharing your pattern, I am looking forward to start with it. I am confused on where 2nd round of petals start, on previous petal round or on underlying round? I found your video for purse. Now i understand. This is so stunning! I am new to crochet and was wondering if you had a video tutorial? Also can you please tell me the yarn and what colors you used for your pillow? This Wildflower and the Zinnia are beautiful!! I am amazed at how you were able to create these. I do good just reading a pattern and following along. You are truly talented. I am beginning the the wildflower and I want to do the zinnia next. The creator for the featured Wildflower pillow and Sophie blanket is [name removed by Admin] from the FB group “Offical CCC Social Group” and it is doubtful you’d get a straight answer on any details of her work. She did say in a previous 2015 post that her yarn came from Australia – Cleckheaton 8ply and that to square it off it took some tweaking with trebles to get it right. To my knowledge she has yet to post her work in Ravelry. I asked in that 2015 post…no reply. Thank you Samantha! Finally, an answer to a years-long mystery 🙂 I removed her name from your post only because it sounds like she’s chosen not to share the info, which I totally respect, and I don’t want to send a ton of people her way. But it is SO nice finally having an answer! I’m sorry you feel that way Samantha, I thought I tried to be very helpful. Is there anything else I could do? I am not sure how to post on Ravelry, sorry! Thank you! I love this pattern for it is easy to follow! It is beautiful! This is a great pattern. You have some really interesting patterns on your site. I love this flower, thanks so much for the pattern! I want to make a pillow with this flower. However, I’m confused about how to add the granny square after I have made the flower larger. I can make the back of the pillow but adding the granny square on to a larger flower is a puzzle for me. Can you please help? ? It would be very helpful for people like me to be able to just click on a ‘Print” button to get a copy of your patterns as I struggle with trying to get a PDF to download or whatever on my system. Hello Rebecca, thank you for sharing this ingenious flower. I have been crocheting flowers for 3 years. In fact, it is the reason I learnt how to crochet, as I wanted to make flowers to decorate the hats I was wearing for alopecia. With your inspired pattern, I can make much bigger flowers for my hats without them becoming bulked up, like a lot of other crochet flowers do when I aim for a larger diameter. 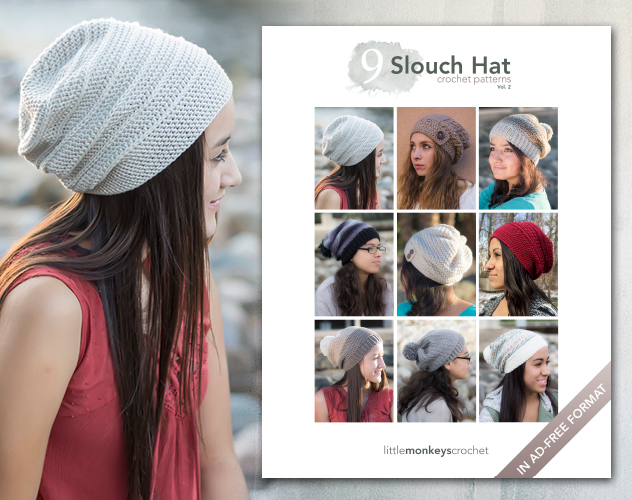 I am thinking of using your pattern to crochet a beanie by stopping increasing at around row 7 (depending on thickness of yarn and size of hook) and then continuing for as many identical rows as needed for the right beanie length. I imagine it might need something (a bobble or compact flower?) on the top, otherwise it could have a caved in look there from the flatness of round one. Have you ever tried this? If so, did it work out well? Hi, I was able to use Print-friendly to turn your Never Ending flower into a pdf file. So the problem has been sorted for you. Thank you for being so generous with your talent. Hi, I was so happy to find your pillow. Do you have a pattern for the back side? What pillow are you referring to? Saw finished product this morning by a lady on Facebook- how beautiful is this! How talented are you! Thank you for not only providing a pattern but also tutorial. The cushion in the above photo is mine. I created it from your pattern…..thank you so much. And yes the throw on the chair is Dedri’s. I’m so sorry Rebecca, I have only just found all the comments! I didn’t realise it was going to cause such a problem. Thank you for your kind words and thank you for the generosity of your beautiful free pattern! Well, I’ve tried again to download the Never Ending Wildflower Pillow pattern, and all it comes up with is downloading the PDF to DOC business. Even though I’ve done that, I can’t see where to download the pattern. This is ridiculous. You are clicking on an ad. The PDF for this pattern is not free to download. 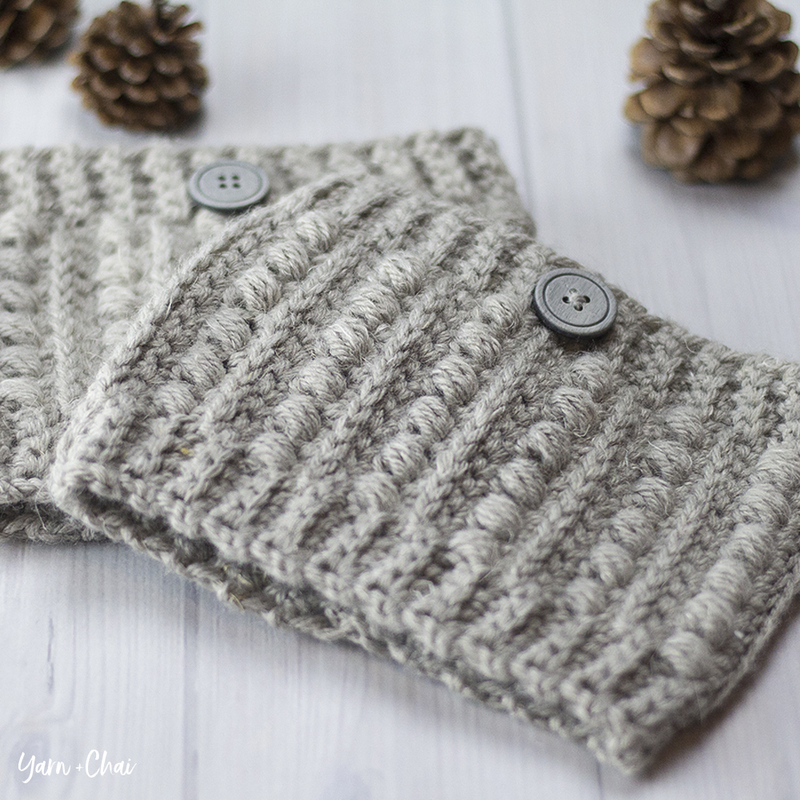 The blog version is free, and the PDF is available in my pattern store as stated in the pattern. Thanks so much for the lovely flower design…I added it to the sunhat I just finished. Thank you for sharing with us this wildfire flower pattern. I started to crochet just a couple of months back and managed to make it and also added an extra row. Now I have to find a way to use it…. Thank you so much for this lovely flower pattern. It is beautiful and I plan to use this with various projects including pillows. Hope you and your babies are doing well. Love this pattern, but there is no way that I can print it. It’s impossible to copy and paste it into a word document. Need a printable pattern, so I can have for later on when I’m ready to use it. Would have to write it out for use. Thank you. I haven’t put on any settings that would keep you from being able to copy and paste, so I’m not sure why that isn’t possible for you. You are welcome to purchase the ad-free PDF version at http://members.littlemonkeyscrochet.com/product/neverending-wildflower/. I just tried copying and pasting the pattern and it worked. I selected the text and then used the key shortcut Ctrl v, which pasted it into the Word document. Hope this helps and it works for you. Forgot to say that after selecting the text I right clicked on it and then left clicked on copy. Then did Ctrl v. Apologies if I’m telling you what you already know. lOVE THIS PATTERN AND AS SOON AS I GET MY OWN PLACE I WILL START BACK ON THE HOOK..
I’ve searched high and low for a pattern that is FOLLOWABLE (totally a word) which grows to any size and looks awesome. The Zinnia and Wildflower patterns are beautiful. Thank you. I would like to make this flower into a pillow…for each row I should add how many tc per petal….and for each increase dc row how should I do the the increase for rows up to 10? The increase is just a standard increase. As far as the petals, I do all remaining petals exactly the same as I did on the last listed round. I am very excited to show you one of the rugs I’ve made with your wildflower pattern. Thank you so much for the pattern! How can I share a photo of the rug with you? Such a BEAUTIFUL pillow. I hope I can follow. I’m going to start today. Love it so much. Thank you. Thank you so much for sharing this beautiful pattern. I may be late to the party, but I am excited about the possibilities and I am anxious to get started. Just a side note, my birthday is December 28! Please, don’t wrap your son’s birthday presents in Christmas paper. LOL. Thanks again. I love this pattern. Will make into a small rug with a yellow center and white petals, daisy like and back with terricloth for a bathroom. I also do bags as well and it will be a beautiful embellishment for a spring/summer bag. Thanks so much. Just wondering where ti find pattern to complete square i have the flower just not sure where to go from there. Thank you! I havent attempted this yet but would like to mke a pillow. Are there directions for that and where can i get them. thank u much. Hello, I’ve done 11 rows of petals, how do I make it square from here?? Thank you! Thank you for so beautiful patterns. wow, it is lovely,thank you for your tutorial, it is wonderful. Hi Rebecca! I made a dream catcher using your never ending wildflower pattern and posting it on my blog tomorrow with a link to your pattern. A beautiful pattern. I am anxious to get one started. Thank you so very much! Love the pattern. I’m a learner by watching a video. I’ll give this a try since the pattern is available. Any luck in having a video done on this. I think it would make a nice rug for a child’s room. I hope I can follow the pattern. I was wondering if you had considered making the never ending wildflower into a circle vest. Thank you, so much for this pattern. I think it is just beautiful. Thank you for the pattern its beautiful!! I’lltry my best to do it.I’mr really in love with the pattern. I will try it but there is nothing made as I am learning, is that ok? I have a question when changing colors shoyld you do it in a petal round? Absolutely love yhis pattern!